A snake is a reptile. Is a snake a vertebrate or invertebrate? Snakes are cold-blooded. They cannot control their body temperature. If a snake is cold, it lays in a sunny spot to warm itself. Is a snake a mammal? A snake is an insect. What are mongoose known for killing? Snakes are covered in scales. Scales may look moist, but they are actually dry. Is a snake an amphibian? Lizards, snakes, and turtles are . The snake is a(n) animal. Turtles, snakes and lizards are . The snake found the snake charmer to be quite . Is a snake a reptile? A snake's hinged jaw is a adaptation. Frogs and snakes are both amphibians. 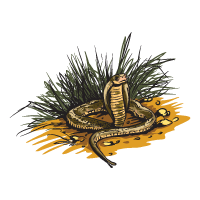 Snakes can be found in the desert.